When querying the Campaign stats endpoint and want to get stats on a day level, you need to specify start_date and end_date. That makes sense. It also specifies date format should follow ISO 8601. That is the only sane date format in the world, so great! I could take you through my frustrating journey of trial and error, talk about how stupid the date handling is, but let’s skip that part and get straight to the solution. That format looks like this, with date, time and timezone. The time zone information HAS TO MATCH the time zone of the ad account, NOT the zone you are in! Convert that timezone value to a UTC offset. Whether you get it from API or interface, you need to take that timezone string and look it up somewhere to get the UTC offset (-08:00 in this case). But wait, what about Daylight Saving Time? Be aware that Daylight Saving Time (needs to die in a fire, but that’s for another day/rant) WILL affect the current UTC offset! That is because on January 1st , the UTC offset in Los Angeles is -08:00. 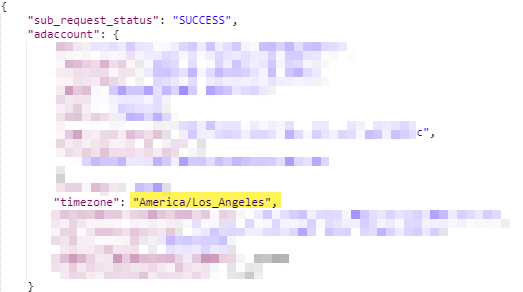 However, if you want to query on April 1st, Daylist Saving Time is now in effect in LA, so the UTC offset is now -07:00!